Today, we will discuss what is python regular expression? or where we can use regular expression? or How to use regular expression? Or What are the usages of re module? Etc. if You are a Beginner in regular expression than this tutorial is Best Place for you!. So, First, we will Start with Some Basic Query About Python regular Expression. "regular expression is a special sequence of characters that helps you match or find other strings or sets of strings, using a specialized syntax held in a pattern. Regular expressions are widely used in UNIX world. The module re provides full support for Perl-like regular expressions in Python. " Python: An Introduction About re Module. 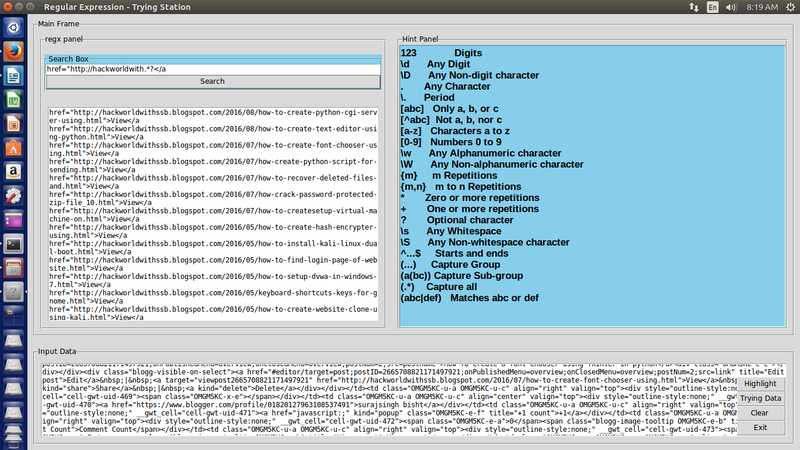 The remodule was added in Python 1.5 and provides Perl-style regular expression patterns. Earlier versions of Python came with the regexmodule, which provided Emacs-style patterns. The regexmodule was removed completely in Python 2.5. Regular expressions (called REs, or regexes, or regex patterns) are essentially a tiny, highly specialized programming language embedded inside Python and made available through the remodule. Using this little language, you specify the rules for the set of possible strings that you want to match; this set might contain English sentences, or e-mail addresses, or TeX commands, or anything you like. You can then ask questions such as “Does this string match the pattern?”, or “Is there a match for the pattern anywhere in this string?”. You can also use REs to modify a string or to split it apart in various ways. Regular expression patterns are compiled into a series of bytecodes which are then executed by a matching engine written in C. For advanced use, it may be necessary to pay careful attention to how the engine will execute a given RE, and write the RE in a certain way in order to produce bytecode that runs faster. Optimization isn’t covered in this document because it requires that you have a good understanding of the matching engine’s internals. Now, We Know Basic Things About Regular Expression. So, Let’s Take a look on This Small Example. Here, we will use Pattern Matching Using search. text = "the man of steel can break that wall." we import the re module and create a simple string. Then we create a list of two strings that we’ll search for in the main string. we plan to search for and actually run a search for them. If there’s a match, we print it out. Otherwise, we tell the user that the string was not found. There are a couple of other functions worth explaining in this example. You will notice that we call span. This gives us the beginning and ending positions of the string that matched. you’ll get a tuple like this: (14, 20). which is what we do next. which should also be the two numbers that we get from the span. For Beginner Here I Created A Small Python Script. I Entered regex pattern on search To filter all links of blog pages. if You also want this script for practice purpose.